When the migration task completes, you can compare your task results with the expected results. On the navigation pane, choose Tasks. Choose your migration task (migratehrschema). Choose the Table statistics tab, shown following. 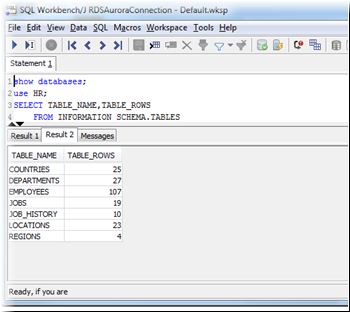 Connect to the Amazon Aurora MySQL instance by using SQL Workbench/J, and then check if the database tables were successfully migrated from Oracle to Aurora MySQL by running the SQL script shown following. Run the following query to check the relationship in tables; this query checks the departments with employees greater than 10. The output from this query should be similar to the following. 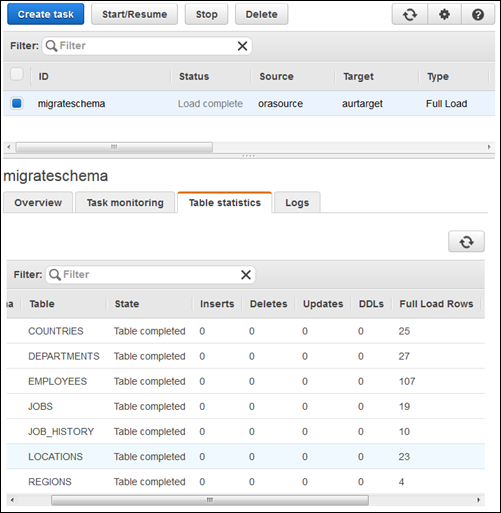 Now you have successfully completed a database migration from an Amazon RDS Oracle DB instance to Amazon Aurora MySQL.